The announcement of Google's plan to shutter Google Reader this summer (July 1) has had people scrambling to try alternative ways to subscribe to and read their favorite blogs. I've been recommending Feedly, but Flipboard is an excellent option too. Last week Flipboard added a new feature that I think a lot of people will like. 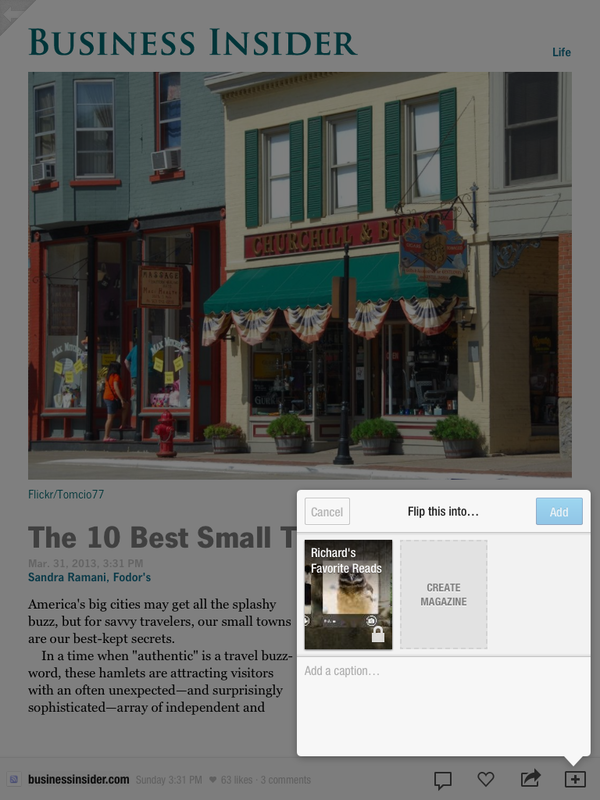 Flipboard users can now create and share their own digital magazines. To create your own Flipboard magazine you have to first create a free Flipboard account. Then install the Flipboard bookmarklet in your browser (Firefox, Chrome, or Safari). After you have the bookmarklet installed you can click it whenever you find something you want to add to one of your Flipboard magazines. You can also send items to your magazines from withing the Flipboard app as you read through your feeds. To do that just click the "+" icon while reading an article in Flipboard. You can create public and private magazines for as many topics as you like. For example, you could create a magazine about teaching mathematics and a magazine about school administration. Personal Flipboard magazines is currently a feature only available to iPad users. Flipboard promises that the feature will be available for Android users soon. Adding items from your web browser. Adding items from your iPad. In a social studies class you could have students curate and create a magazine of articles about a current events topic. You could also have students create collections of travel articles as part of unit of study on regions and countries. Creating and sharing your own Flipboard magazines could be a good way to share your favorite articles with colleagues.